Do you excitedly express how many times you have listened to your favorite Christmas CD or Pandora station whilst wrapping copious amounts of gifts, baking dozens of cookies, and handwriting hundreds of holiday ‘update’ letters to friends and family? Or does your heart skip a beat and mind zoom into a frenetic frenzy of to-do lists, momentarily paralyzing your comprehensible speech due to overdrive of unrealistic, unattainable, and unnecessary standards and pressures you place upon yourself? Truthfully, I fall somewhere between these extremes. Modern culture has perpetuated the weeks leading up to November and December holidays as a distressful and draining time of year (physically, mentally, emotionally, and financially!) . Here’s a secret: It doesn’t have to be that way! As a Wellness Coach, I’m offering ideas to anyone with interest to tame the mind, calm the nervous system, and honestly enjoy at least a portion of the time you choose to spend with family, friends, neighbors, or even strangers! This 5-step plan can help you de-stress this holiday season. 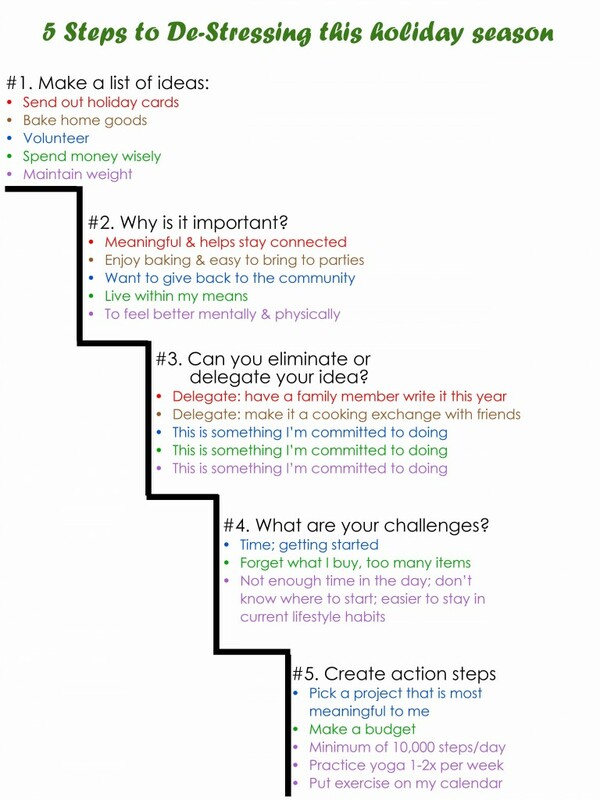 Below is an example of how you could create your list. Each color is coordinated to the idea to show you the progression to alleviate stress. Come up with a grand plan! Make a list of tasks or ideas. Write at least one reason why each part of your plan is important to you. Certainly add more reasons if applicable. Determine if there are tasks or ideas you can eliminate or delegate. These are your ‘negotiables’. Consider potential challenges or obstacles to what you are hoping to achieve. Identifying challenges helps stimulate problem-solving and decision making. Hope this helps you de-stress this holiday season! Afterall, you should be enjoying this time with loved ones, not stressing about it. And remember, you can use this 5-step process any time of the year!